This mid range media PC offers excellent options for storage, power and expansion. It can accommodate two 3.5" drives, SSD, M.2 drive and several full-size PCI Express cards, making it an ideal media/gaming system. Built inside the excellent Jonsbo G3 media chassis, the Serenity Entertainment system provides practicality and beauty. This machine has been designed to allow the user to use it for virtually any purpose, whether it is for media and/or gaming. It has the ability to accommodate a high end 8th Gen Intel CPU along with a high end nVidia graphics card! The PC itself doesn't compromise on performance, and can be built pre-installed with up to 64 gigabytes of DDR4 memory, one of Intel's 8th Gen processors and the very latest motherboards that features USB 3.1 and a super-fast M.2 socket. There is also a wide range of graphics cards available if you plan to use the system for gaming. We supply the Asus H370-A motherboard with this system which offers a wealth of features suitable for all applications. The motherboards support the latest 8th Generation Intel Core processors, bringing together a unique blend of features and technologies that offer the absolute ultimate platform for your PC. You'll find USB3.1 ports on the rear of the motherboard, which is twice the speed as USB 3.0 for amazing fast file transfers. The motherboard also features two M.2 slots. A typical Solid State Drive (SSD) has a read/write speed of around 550 MB/s, with a M.2 drive you can expect speeds of over 2000 MB/s! We therefore highly recommend opting for a M.2 drive for your operating system due the incredible speed it offers compared to a standard SSD. Configuring any system can be a daunting task and this system is no exception. Before you take the plunge and start ticking boxes, ask yourself what do you exactly want the PC to do? Flicker-free 4K - As previously mentioned this system is designed to connect to an ultra-high resolution TV/monitor. Even though the integrated HDMI port is capable of producing a resolution of 4096 x 2160 it can only do that at 24Hz via the HDMI port, which can produce a latency due to the low frequency. Therefore if you are looking for the smoothest possible playback then we recommend opting for one of the optional graphics cards, all of them feature HDMI 2.0 which is able to achieve a resolution of 4096 x 2160 @ 60Hz, giving smooth flicker-free visuals. Alternatively you may want to opt for DisplayPort, but this port is not always available on TVs. Gaming requirements - When considering which graphics card to opt for from a gaming point of view you'll need to ask yourself two questions, firstly which games will be played? Virtually every game has different system requirements which can make choosing the most suitable card tricky. Our experiences tells us it is always better to go for a graphics card that is better than the recommended system requirements, this not only future-proofs you but also gives you better performance. Another thing to consider which is extremely important is what resolution do you plan to play the game at? Running a high demanding 3D game at 1080p is relatively easy for the graphics cards listed in the configurator below, we would expect any of them to maintain around 60FPS without breaking a sweat. This issue lies when the resolution is increased beyond 1080p. For example we would not expect a GTX1050 to be able to play a 3D game at 4K resolution at around 60FPS, you would need to consider a more powerful graphics card, like the GTX1060 or even the GTX1070, even then maintaining 60FPS will still be difficult due to the high resolution. If you are looking for the highest possible frame rate at a high resolution, then we would recommend the Serenity Ultimate 4K Entertainment PC as a better option as it is able to accommodate two graphics card for greater performance. Cooling options - As this is an air cooled system it will not be silent, but be rest assured we only use the quietest components available so the noise the PC will make will be extremely low. We have chosen extremely quiet CPU coolers and even the graphics cards are designed to only use the fans when the GPU exceeds 60°C. Of course during high intensive CPU and GPU tasks the fans are designed to run faster to provide additional cooling. But during quieter times, like watching a movie, the system will be virtually silent! The Jonsbo G3 is shipped with one 120mm cooling fan, but we have made it possible to add another 120mm fan to the system if you require additional cooling. Of course this may not be necessary in most situations but could be useful if you would like to reduce the internal temperature of the installed components and generally improve the cooling. This is especially important if the chassis is in an enclosure or in a warmer than normal environment. If you like to watch Blu-ray films please note that Windows does not have the built-in ability to play Blu-ray movie discs and if you would like to be able to do this, we recommend that you purchase third party software to enable the facility. Software such as CyberLink PowerDVD will allow seamless playback and control of Blu-ray movies. Unfortunately Windows 10 does not include Windows Media Center, therefore we recommend you consider an alternative. The most popular are MediaPortal and Kodi (formally known as XBMC). Both programs offer the facility to do exactly (and much more) what Windows Media Center does, although some configuration is required via plugins (add-ons) supplied by both MediaPortal and Kodi. Both pieces of software are open source which means they are free for personal use and they can be used with any Windows operating system. We highly recommend you take a look at them to see if they are more suited to your needs. Please note that we do not provide support for MediaPortal or Kodi. So if you need a lot of storage space (for videos or large quantities of digital photos for example), then we would recommend an HDD. On the other hand, if you prefer silence and speed (especially boot-up speed), then an SSD or M2 drive would be a better choice. Of course, you can have more than one drive, so you could have the best of both worlds by choosing one of each! We recommend that customers choose an SSD or M2 drive as a boot drive that contains the operating system and important programs. A conventional HDD would store other data but remember that if you intend to have a totally silent PC, you might want to forgo the HDDs altogether as they will make some noise due to their moving parts. Our hardware warranty runs for two years and is "collect and return" meaning that you don't need to worry about getting the machine back to us - we will instruct our courier to collect it from you on a day of your choosing, then after we have checked and repaired it, we will send it back to you by express courier at our expense. In addition, unlike many other PC suppliers, we have an "open-case" policy which means you are free to open the machine and perform your own minor modifications or upgrades without worrying that your warranty might be affected. 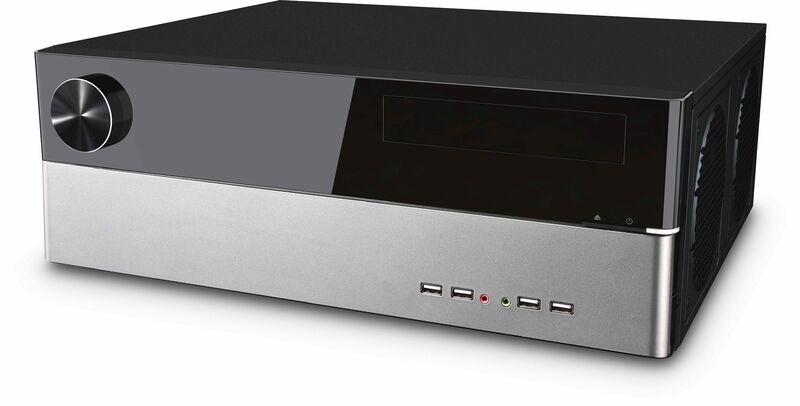 Jonsbo G3 Home Theater PC Chassis ? ASUS PRIME H370-A ATX LGA1151 Motherboard ? 3.9GHz Intel 8th Gen Pentium Gold G5600 2C/4T 54W 4MB Dual Core CPU ? 3.2GHz Intel 8th Gen Core i7 8700 6C/12T 65W 12MB Coffee Lake CPU ? Intel Stock CPU Cooler (i3 and i5 only) ? Scythe Shuriken Rev.B Quiet Low Profile CPU Cooler ? Noctua NF-S12A PWM 12V 1200RPM 120mm Ultra Quiet Cooling Fan ? ASUS Geforce GT 1030 Fanless 2GB Graphics Card ? Palit GeForce GTX 1050 StormX 2GB GDDR5 Graphics Card ? Palit GeForce GTX 1050 Ti KalmX 4GB Fanless Graphics Card ? be quiet Pure Power 11 300W Quiet PSU 80PLUS Bronze, BN290 ? be quiet Pure Power 11 400W Quiet PSU 80PLUS Gold, BN292 ? FSP Hyper S 600W Quiet Power Supply ? 120GB WD Green M.2 SATA SSD (545/465) ? 240GB WD Green M.2 SATA SSD (545/465) ? 120GB WD Green SATA 2.5in Solid State Drive ? 240GB WD Green SATA 2.5in Solid State Drive ? RAID 0 Striped Configuration (choose two or more identical drives) ? RAID 1 Mirrored Configuration (choose two identical drives) ? RAID 5 Drive Configuration (choose three or more identical drives) ? ASUS DRW-24D5MT 24x SATA DVD/CD Rewriter Optical Drive ? ASUS BC-12D2HT Blu-Ray x12 Combo DVD-RW ? TBS 6902 Dual Satellite HD Low-profile PCIe TV Tuner Card DVB-S2 ? TBS 6281-SE Dual Terrestrial HD Low-profile PCIe TV Tuner Card DVB-T2 ? TBS 6205 Quad Terrestrial HD Low Profile PCIe TV Tuner Card DVB-T2 ? TBS 6904 Quad Satellite HD PCIe TV Tuner Card DVB-S2 ?